DISCLAIMER: I like this game a lot; I can’t guarantee that everyone will be as enamored as I was, but either way, I think you should give it a shot. In an ideal world, you would just read this and go play the game to have as pure of an experience as possible, but that’s not reasonable. I’ve done my best to try and outline what I think makes the game so great and also avoid spoilers, but I do go into some detail about how mechanics work, albeit vaguely. Towards the bottom of the post is a link to the demo of the game. If you play it, enjoy it, and want to buy the full game feel free to not read this post and come back later. A couple days ago, I discovered this game called Undertale made by TobyFox. I had no idea what it was about; I played through the demo and got hooked. 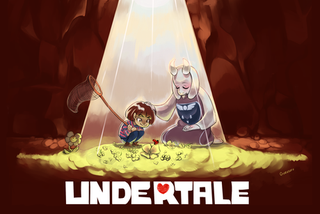 Now a few days later, I can safely say I think Undertale is one of the best games I’ve played in a long time. Let me tell you why. The game’s premise is fairly standard. You’re a little kid who fell into the underground where all the monsters live and you’re trying to find your way back home, of course things are never that simple. You’ll run into a cast of kooky characters and go on your merry way. Despite the standard premise, the game of course runs into its own twists and turns but it really nails both its comedic and emotional moments. The comedy is surprising well done with how often games fall flat when it comes to comedy. I genuinely laughed at a good amount of the scenes in the game and that’s a hard feat for a lot of games to do. At the same time, it can transition and play its emotional moments very well. The game is frighteningly good at building up tension and making you feel like a badass as well as knocking you down a peg and feeling like garbage. The plot is competently put together and all of its pieces fall nicely into place. The characters in the game are also incredibly affable, it’s hard to get mad or upset at this game when everyone is so jovial and charming. When you’re all finished with the game, you may certainly feel a tinge of sadness as you have to say goodbye to these characters. The game’s pacing is also strong, once it hits its stride there’s always something amusing around the corner, it never really stops until the end of the game. Whether it’s a comedic skit or an interesting encounter, you’re never too far away until something amusing happens. But probably the greatest thing about the plot is how it weaves together narrative and gameplay into one cohesive entity. Some games have really cool moments, where the gameplay and story intermix to create an almost surreal moment. Undertale takes on the task of making an entire game based around that single concept and I would say it succeeds. Practically everything in the game ties back into some sort of lore or narrative and the game is very cognizant of it. Furthermore, this game goes one step further and uses this to have a little meta commentary critiquing the way people play games and standard JRPG tropes. This part is pretty hard to talk about without going into spoilers, but if you’re the kind of person that likes analyzing games and the dissection of video game tropes, there’s something here for you. How using mercy works is that each enemy in the game has certain conditions that need to be met until it will yield to you, so in a pacifist playthrough, the game revolves around analyzing the flavour text the enemies tell you and trying to figure out how to appease them. Here’s where some clever writing comes in as you deal with these crazy monsters and try to figure out how to get them to stop fighting. Of course, violence is always an option, but if you play the game that way, you may as well take everything I just said with a grain of salt as the game becomes an entirely new entity when you give up mercy (not bad thing mind you, but different). Suffice to say I wouldn’t play a genocide run until you do a pacifist run first. But seriously, you’ll want to see both the pacifist and genocide endings, I promise it’s worth it. This leads to the second part of combat: Defense. Whenever the enemy attacks, you’re treated to a little bullet hell segment where you have to dodge the enemies attacks. Here’s the kicker, the bullet patterns are all correlated with what kind of enemy they are and the state they’re in. Did you piss off the enemy? Prepare for a crazy pattern. Have they lost the will to fight? The pattern is probably pretty easy. That’s just the tip of the iceburg. What’s arguably even more impressive is how the game continues to evolve right to the very end. With this creative combat system, there’s a lot of neat variations that the game can comes up with as it continues to gradually introduce new mechanics all throughout your playthrough. Each boss adds a little new twist on how the game can be played and really pushes the capabilities of the combat system leading to some really creative and memorable fights. Even if someone disagrees with me on every other point I’ve made here, the one thing I’ve seen everyone agree on unanimously about this game is its soundtrack. The soundtrack to this game is phenomenal. There’s approximately 100 music tracks in the game and they all fit each situation damn near perfectly. Whether it’s just a track for exploring the snowy forests (avoid the youtube comments in case of spoilers), or a fight in which you need to gather your determination. The game has you covered. If you’re already a fan of TobyFox (most notably known for making the music to Homestuck) you can be sure he uses his signature song. Another fascinating aspect to this game is how much attention to detail is put in this game. I’m talking a game that can rival the Metal Gear Solid in how many ridiculous inconsequential secrets and minutia the game is packed with. TobyFox went through this game with a fine comb and almost every sort of interaction you can think of probably exists. Whether it’s taking and holding onto an item from the beginning of the game just to use it on a boss near the end of the game so he’ll spit out a single unique line of dialog or the fact that right before you finish the true end to the game you can backtrack to the beginning of the game and almost every NPC has a new line of dialog. This game knows the devil is in the details. Of course, as much as I loved this game, it’s not without its imperfections. While the indie-pixel look is a deliberate way to bring an instant association to one of the big inspirations of the game (Earthbound), I’m sure a lot of people would be turned off by the art style. There’s also some otaku anime humour in the game that will go over a bunch of people’s heads if they don’t get the reference. The game also expects you to experiment and doesn’t really hold your hand at all once you get past the opening area, meaning there might be sections where if you can’t figure it out, you kind of just bang your head against it for a while (for example, I watched a streamer not put two and two together during a certain puzzle and just try to brute force his way through, it wasn’t pretty). But otherwise, these flaws don’t detract enough from the experience to be a significant hindrance. If you want to give this game a try, there’s a demo available here. The demo probably takes about 30 minutes, once you beat the demo once, try and get a different ending. This will give you a little taste of what the game is about. Undertale is a unique game that comes out once in a blue moon. You don’t want to miss it.